Officials say 102 pilgrims have been killed in a stampede at a religious festival in the southern Indian state of Kerala. At least 44 more have been injured in the crush, which was reportedly triggered by a road accident. The pilgrims were returning from the Hindu shrine of Sabarimala, which is in a remote, mountainous, densely-forested area. Hundreds of thousands of pilgrims had gathered at the hill shrine on Friday, the last day of an annual festival. The festival runs for two months and attracts millions of visitors every year. Reports differed as to exactly how the deadly crush was triggered. The Indian PTI news agency said a jeep carrying pilgrims had driven into a crowd returning from the shrine, starting a panic. However, the Times of India reported that the incident happened when the jeep broke down and overturned as pilgrims tried to move it. It crushed a number of people and caused others to stumble, which then triggered the stampede, the report said. 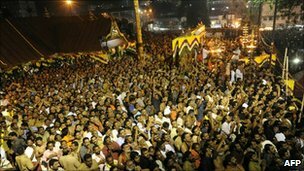 Correspondents say deadly stampedes are not unusual at Indian temples, where huge crowds gather in small areas with few safety measures or crowd controls. A similar tragedy happened at Sabaramila in 1999, when more than 50 people died in a stampede after a landslide on a crowded hillside. A stampede that killed at least seven soccer fans in the Kenyan capital started after a group without tickets tried to storm through a stadium entrance, a game official said Sunday. The latest news report highlighted 36 people were crushed and at least 64 others were injured in a stampede as a crowd tried to leave a stadium following a religious ceremony. Tens of thousands had gathered to receive blessings from one of Mali’s best known imams, Osman Madani Haidara, during the Muslim holy period of Maouloud. Witnesses say the stadium in this West African nation had been holding many more than its maximum capacity. As the participants departed the ceremony Monday night, the crowd surged against a metal barrier, said Sadio Gassame, Mali’s minister of interior security and civil protection said. Last year, at least 15 people died in another stampede at a mosque in Timbuktu, Mali during the same religious period.